Experts from Canonical, the company behind Ubuntu, and Fraunhofer FOKUS explain how Open Baton, an open source, carrier-grade NFV Management and Orchestration (MANO) platform can integrate with Canonical’s Juju to easily deploy scalable VNF services. 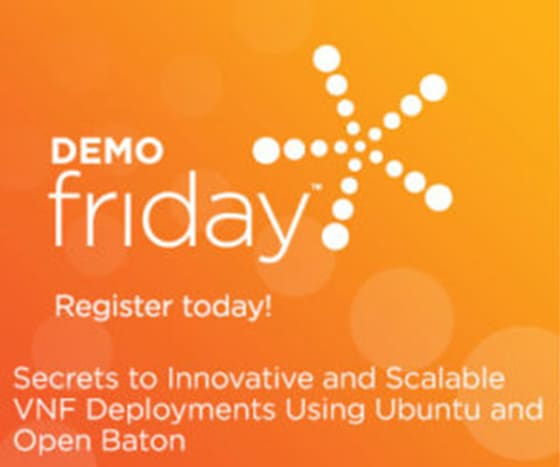 If you’re a service provider interested in understanding the state-of-the-art for orchestration of VNF services and looking at the best practices, or a networking vendor wanting to understand how to participate in cutting-edge ecosystems that Open Baton and Juju can provide, you will not want to miss this webinar. The Open Baton ETSI NFV-compliant framework uses a microservices-like architecture to allow seamless integration of heterogeneous infrastructural components. All the communication realized via a pub/sub mechanism enables the easy integration of new feature components with very low development effort. Canonical will show in the webinar how an extensive set of use cases can be realized combining additional components provided by the Open Baton framework (i.e. autoscaling, fault management, etc.). Juju is a highly-successful universal service modeling system. It is at the heart of Canonical’s orchestration across multiple deployment substrates (private and public clouds). It models services, their relationships and scale, independent of substrate (cloud, virtualized or physical). The webinar will explain why Juju, with its service-based model, makes it particularly well suited to the role of VNFM. The unique joint MANO solution in this demonstration will orchestrate the cloud native OpenEPC VNF from Core Network Dynamics on a de-facto standard OpenStack NFV infrastructure. An elastic data-plane use case will be demonstrated using a policies based workflow leveraging application level metric events to trigger autoscaling. Join SDxCentral in a joint presentation from Canonical-Ubuntu and Fraunhofer FOKUS on April 7, 2017 at 10:00 AM PDT to learn how Service Providers can reduce risk and improve scalability with model-driven, cloud-native Network Services (VNFs).